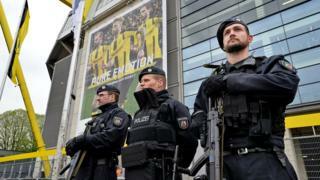 Borussia Dortmund bombs: Part of an elaborate scam? It could have been taken from the plot of a James Bond film. A criminal, desperate to make a quick buck, decides to bomb a bus filled with top-flight football players on their way to one of the club's most important games of the year. In the resulting chaos, shares in the club plummet, and the wrong-doer makes his money and escapes into the night - albeit, potentially chased by 007. But while it may sound like a tale dreamed up by Hollywood scriptwriters, this is actually what police believe happened on 11 April, when the Borussia Dortmund football team were on their way to a Champions League game. Police initially believed the bombing - which left Spanish footballer Marc Bartra needing surgery - was the work of terrorists, helped to that conclusion by a number of letters purportedly written by Islamic extremists left near the site. But they soon concluded something was amiss, and turned their attentions to a 28-year-old investor named only as Sergej W, whom they have now charged with attempted murder. Did this actually happen in Bond? Yes, in Casino Royale, Bond's nemesis Le Chiffre decided to short sell shares from an aircraft manufacturer in order to fund a terrorist organisation. His plan was to push down the value of the shares by blowing up the company's recently unveiled plane, the largest in the world. In this case, however, the plot failed when Bond foiled it. But how do you make money by making shares fall? There are several ways a trader could have made money in this instance. The process used in Casino Royale is known as "short selling", and is basically when traders bet on a share price falling to make a quick profit. It involves someone borrowing a long-term investor's shares for a fee, and selling them on to a third party. When the shares fall, the trader quickly buys them back for less money. The stocks are then returned to the long-term investor, who is not worried by the decline because they weren't planning on selling yet anyway. This was also the method used by speculators portrayed in the 2012 film, The Big Short. A second way is by buying "put options". A put option on a share or some other asset is a contract which allows an investor to sell the asset at an agreed price. If the market price falls, they can then buy the asset more cheaply and sell it - or exercise the option - at the higher price to whoever sold the option, and pocket the price difference. If the police are proved right, the trader in this case was backing up his bet by ensuring the shares definitely did take the hit, by blowing up a bus. This is almost certainly the first time someone has tried to blow up a football team in order to make money. More usually on the less ethical end of the market, the stock might be pushed over the edge by a few well-placed rumours. Indeed, back in 2012, all it took was a tweet to send share prices plummeting. A hacker broke into the Associated Press Twitter account and claimed then-President Barack Obama had been injured in an attack on the White House. The Dow Jones Industrial Average dropped 150 points as more than 4,000 people retweeted it.